(Nanowerk News) By tagging bone marrow cells of mice with a genetic label, or barcode, researchers were able to track and describe the family tree of individual blood cells as they form in their natural environment. The scientists discovered that these cells regenerate differently than their counterparts do after a blood cell transplant, according to a study published in Nature. "The findings of this research, if applicable to humans, will have implications for blood cell transplantation, and for clinical and research methods using blood cells, such as gene therapy or gene editing," said John W. Thomas, Ph.D., Stem Cell and Cell-based Therapy Coordinator at NHLBI. 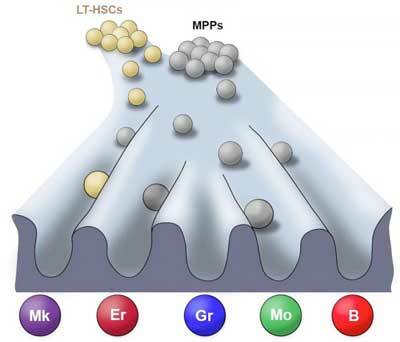 "Our results show that stem cells and their less pluripotent descendants, blood progenitors, behave somewhat differently when studied without removing them from their native environment versus when studied in a laboratory or in transplantation; leading to differences in the type of blood lineages they make," said study's first author Alejo Rodriguez Fraticelli, Ph.D., from Harvard Stem Cell Institute, at the Boston Children's Hospital. Due to the lack of appropriate tools to study how blood forms in the natural environment of the body, the majority of studies about where individual blood cells come from have been done after a transplant. In that context, the transplanted cells would have been "perturbed," or removed from their natural environment. According to the researchers, the current models are more likely to represent a roadmap of lineage potential for the blood cells' natural offspring. For Rodriguez Fraticelli, this highlights the importance of studying blood regeneration in its native context. "Moving forward, we need to come up with methods to better predict what types of cells will be the most optimal for therapy, for instance in reprogramming cells, and editing," he said.